As the sun sets tomorrow night, Jews around the world will gather and dip specially-shaped challah into honey to celebrate Rosh Hashanah and symbolize the hope for a sweet New Year. Some communities bake challah in the shape of a bird for protection, a ladder for spiritual ascension, or a hand-shaped hamsa symbol for good luck. The most recognized shape is a circular challah, representing the continuous cycle of life. 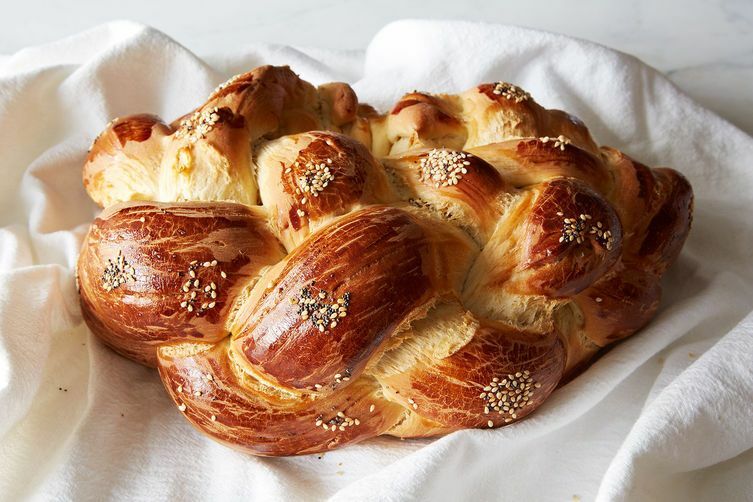 In her latest video for Tablet Magazine, Joan Nathan shares her favorite challah recipe and shows us how to braid it into an applause-worthy centerpiece for your Rosh Hashanah table. More: On the off chance that you have leftover challah in the morning, don't forget the French toast. First you weave a six-stranded braid. It might look complicated, but don't be intimidated. Before you know it, you'll be chanting alongside Joan, "outside over two, next to last to the outside, outside over two, next to last to the outside," and creating your own intricate work of art. Then you twist the dough into a circle, decorate it with seeds, and pop it in the oven. Not perfect? No problem. According to Joan, "who cares?" With this round challah, you'll be sure to ring in a joyous New Year. L'shanah tovah u'metukah -- A sweet and happy New Year to all! Photo by James Ransom. Video by Tablet Magazine. I've made this four times and twice dough barely rose and ended up being a brick. Other two times it was perfect and spectacular. Thoughts on why? This wonderful recipe is foolproof, forgiving, and easily adaptable. I have used it many times and it has always, and I mean always, tasted and looked great. I am ashamed to say that it has over-risen on more than one occasion because I was late in getting back from an errand or because I lost track while braiding it but you would never know by tasting it. I have made the recipe as written but have also used less yeast for a longer rise, stuck it in the fridge to let it rise overnight, substituted coconut oil for vegetable oil, and used less sugar (usually when I’m baking only for my family). No matter what I do, it is always a crowd pleaser. You can shape the second loaf into rolls for killer hamburger buns. The leftover challah is especially perfect for Saturday morning French toast (try warming the maple syrup with strawberries or blueberries). The only problem with this challah is that it’s hard keeping everyone away from it until it is cool enough to eat.